As a product built to stop slippage during yoga practice, the Yogitoes skid-less yoga towel is a hygienic and efficient way to ensure you get the most out of every pose. Each one of these skid-less mats is tailored from an 80% polyester and 20% nylon blend, and is available in a variety of different Chakra stimulating colors. 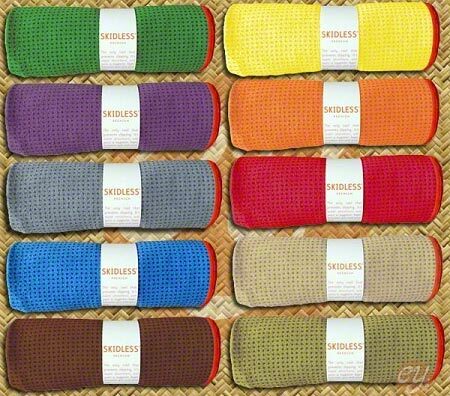 In order to avoid harsh chemicals, the mats are tinted with organic eco-friendly dyes only. In order to stick with the eco-friendly trend, the non slip property is created with hundreds of clear silicon dots which are adhered to the bottom of each towel. These yoga towels are made to fit perfectly over your standard sized yoga mat (68” by 24”) while the silicone dots hold on tight as you move through your practice. Using a Yogitoes yoga towel helps to minimize the friction caused by movement against your mat, which in turn prolongs the mats lifespan. 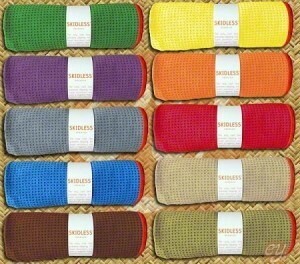 Although the towels are made to be used with the standard yoga mat, they can be used alone if desired. This is a great way to take yoga with you when traveling and save space by not needing to lug around a bulky mat. While using the Yogitoes skid-less yoga towels you will appreciate how stationary they remain even during the most challenging of vinyasas. They are extremely absorbent so they trap your sweat during any style practice, but work very well when used during hot and Bikram style yoga practices. Some users actually prefer to wet the towels before starting, just to create an instant seal between their towel and mat. To be honest, the only two problems I have found with this product are its comfort while using without a mat, and its price. While I love having the ability to leave my yoga mat at home when traveling, using the towel without a mat is not very comfortable in poses requiring boney body parts to contact the floor. If you don’t mind modifying your practice to avoid knee to towel/elbow to towel/ankle to towel contact, using this product without a mat will not be a problem. As for my issue with price, if money does not grow on trees in your area, buying the Yogitoes towel may not be an option.